We are living in a decade where digitalization has taken a roller coaster ride when it comes to marketing practices. Being part of a digital country, each person is overly dependent on the internet which has led to the massive use of digital platforms by the businesses to promote their brands. Whether you want to read any news, buy clothes, rent a home, book airline ticket, etc, everything is digital. Therefore its high time for small enterprises to look for digital marketing strategies if they want to survive the competition and make big out of it. Digital Marketing is a trendy, exclusive but evolving industry where each day new way launches and change the course of marketing trends. I understand the necessity to keep updated with the latest trends. 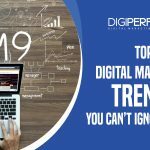 Therefore, I have decided to share the basic but important digital marketing trends that will totally rule in 2019. It is already been forecasted by marketing experts that Visual Content will dominate 2019 than any other form of marketing. Images and Videos will become “Universal Language” to be followed and will urge businesses to incline towards this form of marketing. 90% of the visual information is transmitted to the brain than ordinary texts as brain processes 60,000 times faster in grabbing visual content than words. This fact justifies the importance of clubbing visuals like pictures, videos, infographics, etc in your marketing strategy to grab more attention by viewers or readers. Mobiles have become an important partner in their lives. Whenever a person wants to search for any item, they take their cell phones and start Google-ing. This shows today we are highly dependable on mobile which in turn guides us to take mobile compatibility at precedence. Even now, Google guiding everyone to create mobile-friendly websites that would on mobile search results. It’ll no longer be enough to have an SEO-optimized site or even just a “mobile-friendly website“. Today, Google examines the mobile performance of your website to provide the best mobile-friendly experience to its users and rank your website accordingly. Regardless of what type of devices your customers use, mobile compatibility is going to take a leap if you want to stay ahead in your search rankings. As I have stated earlier, the mobile-friendly website will work wonders for you today and in the coming year. With the same methodology, Google is also considering SEO’s website auditing checklist with the main focus to improve organic search results. Brands and online website should consider to re-examine their websites and get them optimized for mobile view with a focus to SEO audits on top of all the online activities. It’s a fact that AI (Artificial Intelligence) is being adopted by every consumer-facing industry. This is the industry that can help businesses on the backend like chatbots. Chatbots are very much common among e-commerce industry or where the chatting is a major part of the functioning like Swiggy, Foodpanda, etc. Siri is the first and famous example of artificial intelligence adopted by the mobile industry. This year, AI will help brands to dig into the data and reach their target audience with more effectiveness and clarity. As per the recent market trend, video advertising is ready to capture over 82% of the whole internet traffic by end of the year 2019. It is anticipated that there will be a massive rise in video ads on all online platforms. What might change is the content and duration of videos as brands battle to seize viewers’ attention. The year 2018 witnessed the emergence of several new products, services, and applications for IoT. And the scale will continue to grow in the year 2019 as well. Moreover, IoT & data are anticipated to transform the major industries like education, healthcare, and manufacturing. The technology not only helps in enhancing the effectiveness of these domains but also changes the way these organizations used to do their work. Mobile-First index algorithm by Google has created a lot of buzz in the marketing arena. Marketing professionals need to identify how this algorithm will impact their search engine rankings. Now, SEO-optimized websites or just mobile-friendly websites will not enough to rank them on SERP. The search giant will examine the performance of your website on mobile and will provide the rankings accordingly. No matter what type of devices your customers are using, mobile friendliness should be the top priority if you want to hold your SERP rankings. Regardless of the huge predictions, The VR and AR technology incapable of impressed the audiences in the previous two years. Nevertheless, experts predict that the year 2019 will bring huge changes to this domain. Organizations expect AR software to produce greater revenues as compared to VR software. Usually AR is outdone by Virtual Reality; however, AR has gradually been rising in its shadow. In the year 2015, the worldwide worth of AR market was around $3.33 billion. And, it’s expected to reach about $133.78 billion by the year 2021. Content is the backbone of any type of marketing. The significance of content will stay similar in the year 2019 as well. However, the ways of content marketing will change according to the audience behavior and preferences. There will be a significant boost in the use of visual content. Since, people are more engaged with videos, images, and infographics as compared to plain text. Stats reveal that the content with significant visuals gets 94% more views. As I’ve pointed this previously, only having an SEO-optimized site may not work for you in the coming years. With the emergence of the mobile-first algorithm, you need to plan your SEO strategy from zero for the year 2019. You should re-examine your websites and optimized it for mobile view rather than waiting to receive a hit later. 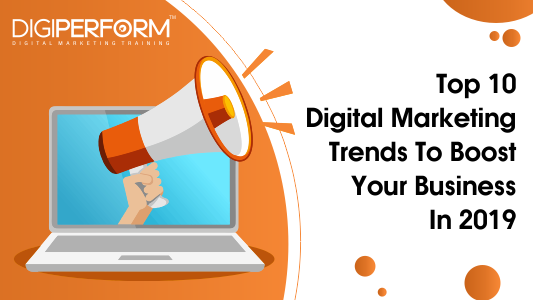 These are a few of the Digital trends that have driven digital marketing in 2018. As the year unfolds, we’ll see which ones rise to the top… and which ones fall to the wayside. Why should the Small Businesses consider Digital Marketing?